For more than ten years, the California Domestic Workers Coalition has waged the campaign for the California Domestic Worker Bill of Rights to correct the history of exclusion from basic labor protections and to advance the rights and dignity of domestic workers. In 2006, organizations came together for the first time to pass AB 2536 (Montañez), the original “Household Worker Bill of Rights,” which would have granted overtime protections to personal attendants and would have fined employers who failed to pay through liquidated damages. The bill was passed through both the Senate and Assembly and was vetoed by Governor Schwarzenegger. Equal right to rest and lunch breaks for personal assistants. 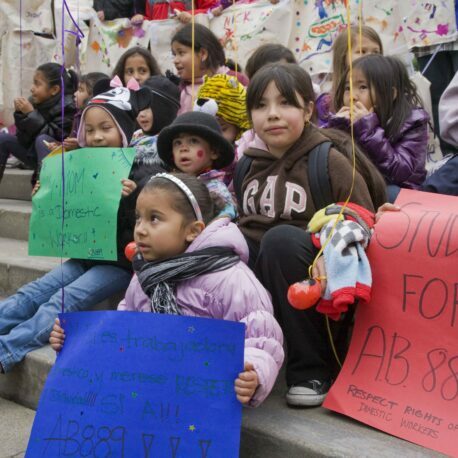 AB 889 passed through both the Assembly and the Senate, but was vetoed by Governor Jerry Brown. In 2013 after advocating for over seven years, growing the political power in sacramento, and gaining invaluable experiences in the statewide policy arena, the California Domestic Workers Coalition won a historic victory with the passage of AB241 (Ammiano), which extended overtime protections to personal attendants (such as nannies and homecare attendants), on the condition that the law would sunset after three years. In 2016, The California Domestic Workers Coalition again won historic legislation, SB1015 (Leyva), making the provisions of AB241 permanent under state law. SB1015 was signed into law by Governor Brown in Sep 2016. The California Domestic Workers Coalition believes that all domestic workers deserve basic labor protections and dignified work conditions. The campaign for the California Domestic Worker Bill of Rights continues, so long as domestic workers continue to be excluded from dignified and fair labor standards. As new rights for domestic workers get written into the law, it is equally important to ensure that both workers and employers are empowered with information about the labor laws governing this industry so that the rights of domestic workers may be upheld in every California home. In 2018, the California Domestic Workers Coalition launched its “Our Work, Our Dignity” Campaign to make domestic worker rights a reality through introducing AB 2314 (Ting): The Domestic Worker Rights Implementation Act. The bill would have establish a program within the California Division of Labor Standards Enforcement to provide outreach, education, and training to both domestic workers and employers on domestic worker rights with the goal of increasing awareness of and compliance with existing labor protections. AB 2314 passed the California State Assembly and the Senate with overwhelming support, but was vetoed by Governor Jerry Brown.. In 2019, the coalition continues to advocate for a Domestic Worker Rights Education and Outreach Program to address the unique and pressing needs of the industry. The program would provide education, outreach and training to domestic work employees and employers on minimum wage, overtime, sick leave, record-keeping, retaliation, and the DLSE wage adjudication and retaliation process. The program would increase awareness of and compliance with existing labor protections within the domestic work industry to promote fair and dignified labor standards across the industry. In 2016, the California Domestic Workers Coalition partnered with Pilipino Workers Center to launch the CARE Agenda, a declaration of our vision for a long-term care system that supports the dignity of consumers and upholds fair employment standards for caregivers. 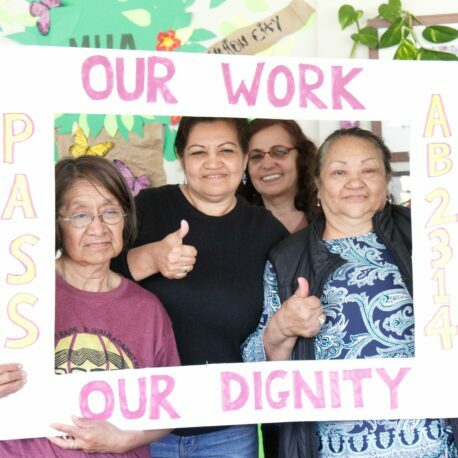 This year, as a member of the California Aging and Disability Alliance, the California Domestic Workers Coalition is helping bring the vision of the CARE Agenda to fruition through support of SB 512 (Pan). This bill would establish the California Long-Term Services and Supports Benefits Board (LTSS Board), to be composed of 9 specified members, to be able to manage and invest revenue deposited in the California Long-Term Services and Supports Benefits Trust Fund (LTSS Trust) and to finance long-term services and supports for eligible individuals, upon appropriation of funds. The bill would also create the Long-Term Services and Supports Advisory Committee, composed of nine members that have experience in aging and disability services, from both consumer, worker and provider perspectives, for the purpose of providing ongoing advice and recommendations to the LTSS Board.